So one of the easiest benefits of being a music critic is that you tend to be ahead of the curve when it comes to whatever eventually hits the mainstream or the radio, but that's not saying I can't get surprised. And in 2014, that definitely happened thanks to a quiet rerelease from a newly picked up South African band called KONGOS and their massive sleeper hit 'Come With Me Now', a track that never got huge in the US except on the rock charts but was nearly inescapable in Canada - and since the song was absolutely awesome and ended up topping my list for my favourite hit songs of 2014, I had no problem whatsoever with that. And yet it didn't seem like KONGOS was able to notch a second hit in Canada... and going into their discography, I can explain why. KONGOS is a band of four brothers and even in the style of blending alternative rock with kwaito - a South African style of sampling and looping that's closest to probably UK garage - they're a weird as hell group. For one, they've got a knack for off-kilter melodic grooves with a surprising amount of grime, and yet their production is often clean and spacious enough to highlight some pretty damn great hooks... and that's before they introduce the pedal steel, accordion, inverted samples, and an uncanny ability to leap from groove to groove. Coupled with lyrics that are smarter than you'd ever expect and a hell of a lead performance from Dylan Kongos, the band released their sophomore album Lunatic in 2012 in South Africa before self-releasing it a year later in the states, and yet just before the band was about to give up and move on to new material, Epic found them, signed them, and re-released Lunatic to press their advantage. And for a rock band in 2014, the level of mainstream success 'Come With Me Now', which went platinum as a single, was both thrilling and dangerous - even though I'd make the argument KONGOS were far more than a novelty and had serious chops, the eclectic instrumentation and demented subject matter meant that they had to stick the landing or risk being branded as one-trick ponies. So did they pull it off with their newest record Egomaniac? Here's the thing: this is the sort of record where I can't quite say there's a song with the same instant modern classic sound that you'd get with 'Come With Me Now', but that's not to disparage the quality of this album, which really is pretty damn great all the way through. 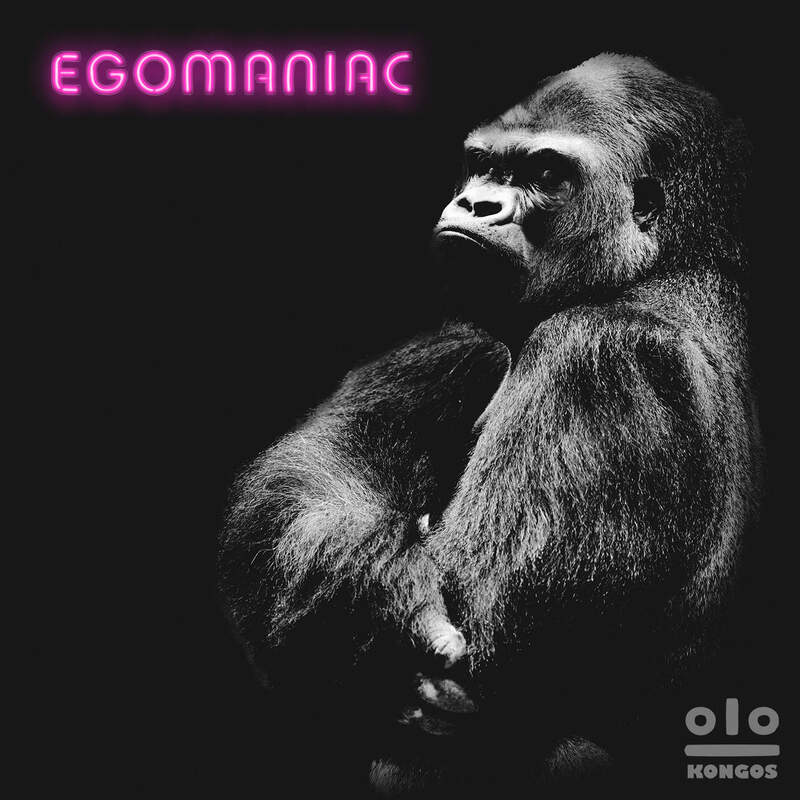 It's not perfect - I'm convinced that KONGOS are yet to make the outright classic record that would blow everyone's mind, but Egomaniac is the sort of record that shows a band refining their strengths while expanding their sound and keeping the writing incredibly sharp. In short, if you're covering modern rock, while it might be easy to ignore the album, it definitely deserves a lot of attention. Of course, the reason that some people will disregard the record are the steps it takes away from a conventional rock sound towards something leaner, sharper, and a fair bit meaner. The genre-blending is still here, but instead of elements of reggae and country, there's more of a electronic or even pop influence with the sharper beats instead of the demented, textured grooves that initially sucked me in. And I'm of mixed opinions how well it works - I've always wished that their production had a bit more bite and texture, a little bit more of an earthy edge overall, but unlike so many others in this vein, they nearly always balance the melodic courtesy of the guitar, darker, buzzing synths, or accordion. Consider 'I Want It Free', which on first listen might seem to be pulling from nearly an identical groove to 'Come With Me Now'... but then they inject weedy melodic fragments that squeal across the mix, a slightly spikier groove, and a huge bridge that swells on a cushion of liquid guitars. And that's one thing that demands attention: for as much as KONGOS has an eclectic instrumental palette, from the cavernous electronics on 'Autocorrect' to the ghostly hollowness of '2 In The Morning' and parts of 'Where I Belong' and 'The World Would Run Better' to the wiry popping of 'Look At Me' that features this fantastic melodic mutation that twists the low thrum of the melody across multiple keys on the post-chorus to 'I Don't Mind' which can probably be best described as a fusion of funk, country, and Irish folk with that central guitar rollick and the huge chorus, this is a band that'll always deliver a huge hook to back up their melodies. And make no mistake, even thought these mixes give the instrumentation more room to breathe, there's a commitment to dynamics that never feel the need to rely on reverb to land impact: I've already mentioned 'I Want It Free', but the real stunner comes with 'Repeat After Me' with the ominous bass-heavy crescendo, rich melodic swell anchored in a brittle guitar lick and the heavier layering of backing vocals. Now I'll admit right out of the gate that I prefer KONGOS when they get darker and crazier - one of the reasons I've always wished their production could get a little rougher, to match the darker tones in the melodies - but Egomaniac walks a tricky line between outright alienation and songs that that go a little brighter on the hook like the excellent closer 'If You Could' which relies most on ramshackle guitars, although I will say that tracks like 'Hey You, Yeah You' or 'The World Would Run Better' really only land impact off of the hook and less off the oddly stiff synth lines that could have afforded a little more flow with maybe a slightly more defined guitar line. Granted, one of the reasons why KONGOS deliver so strongly are the vocals from the brothers, all who contribute lead vocals to songs and yet come together for huge choruses that sound better than ever. I can't quite say I can tell the difference between all of them yet and put names to each of the brothers' voices yet, but there's no outright weaknesses that I can hear as the songs span raw stomping shouts to more earnest ballads to more desperate and raw material. And hell, even though I probably prefer the rougher side more, the vocals on the ballads remind of Brandon Flowers of The Killers with a little more of an edge, and that's only a net positive! Of course, one of the hidden weapons of KONGOS' material is their songwriting, and the title sums it up aptly: egomania. And it highlights the very tricky line they're trying to walk: providng commentary on arrogance and ego all the while highlighting exactly why it can be so damn appealing. In a bizarre way I'm reminded a little of Kesha's better work, which walked the line between raucous party girl and commenting on it, and just like her, KONGOS are in on the ego trip and are wringing as much ludicrous bombast out of it as they can. And yet they're also smart enough to place it all in perspective, not just showing how fun it is but also how it comes with a certain amount of self-delusion and entitlement - with 'Autocorrect' being the shining example of that - and at the same time, the massive insecurity that lurks beneath it all. It becomes quickly apparent that some of that ego is a mask and cultivated image, and one that falls away fairly quickly when trying to get what they really want or reflecting on loss, like the haunting '2 In The Morning'. And yet at the facade falls away you get songs like 'Look At Me' that aren't just looking for the audience's attention but for validation of their existence in the void, and even though the smart decision would be to walk away, that's not what they really want. And that leads to bad decisions that exploit those wiling to validate them that leaves them desperate and ashamed, especially when you have songs like 'Repeat After Me' which shows them trying to break away from false religions and confront reality... or perhaps give up some of that privilege that fuels the ego, a surrender that's far harder to sign, a defense of one's ego that's hard to abandon. And I really love the ending with 'If You Could' that when confronting the morning and sifting through the wreckage of shattered ego, often coming from good intentions, it's the acknowledgement that not only will you often see yourself get bypassed, but that even if you want to start over and do it all again, that's not how life works, and you're not getting that chance. It's frank, kind of brutal... but it's real, and despite how much punch all the hedonistic thrills of the album bring, there's a sense of weight and finality to the ending that sticks with you incredibly well. In short... man, I really dug this record. Again, I wouldn't quite call this the best of the year - there are a few tracks that don't quite hit the same impact and I do wish that KONGOS brought more grit to the table, a little more texture to these mixes - but it's remarkably cohesive, smartly written and ridiculously catchy. In a just world, KONGOS would be dominating mainstream radio with Egomaniac, but as it is, they're getting a strong 8/10 from me and a huge recommendation. Folks, let's not see these guys become one-hit wonders, this is a great album and definitely deserves all of your support, so check it out!